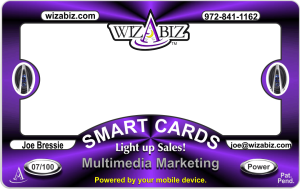 Wizabiz Smart Cards is a cool promotional item that can showcase your newest product or services. The clear plastic cards are less than most promotional pieces and can be changed remotely to keep the viewer revisiting it. The last visual will allow the user to contact you or go to your website while they have phone in hand. Certainly not another stress ball. Your card will be designed just for you with logos and the originality you expect along with the special animated projections behind it. The cards can also include sound. New for 2015 be one of the first to wow your clients with this technology.